Comments: The 10000 Volt Ghost is from the Scooby-Doo episode “Watt A Shocking Ghost” originally broadcast in October of 1976. 26 years later, he is immortalized in semi-clear orange plastic. From 1999-2002 Equity toys released numerous Scooby Doo figures in several different scales. Its my opinion that their best work was in the 5″ scale, where they produced not only excellent version of the main Scooby cast, but were also able to do a ‘Greatest Hits’ of classic Scooby-Doo monsters. 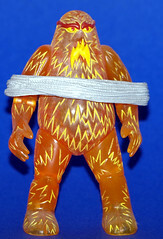 This included the 10000 Volt Ghost who is everything you could want from a plastic version of a Hanna-Barbera cartoon. The sculpt is simple and clean, he’s semi-translucent and he’s just plain cool.